There are not many places left in America that still host a major Easter parade. 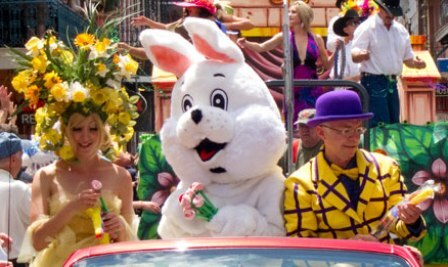 However, it probably comes as no surprise that New Orleans, the world capital of parades, is one place where this venerable Easter tradition is still alive and kicking. The Big Easy hosts several parades on Easter Sunday, the most popular being the Historic French Quarter Parade and the Chris Owens Easter Parade in the French Quarter; and the St. Charles Avenue Easter Parade in the downtown area. The first procession is usually the Historic Parade, which winds its way through the French Quarter from Arnaud’s Restaurant to St. Louis Cathedral in Jackson Square. This is the traditional parade, with participants riding in horse-drawn carriages draped in Easter finery. A second traditional parade marches up and down St. Charles Avenue a few hours later. The Chris Owens Easter Parade, which usually runs in the early afternoon, is sponsored by local singer/entertainer Chris Owens. This one is more festive, with floats, jazz bands and of course, truckloads of bead necklaces. All processions are on Sunday, April 5th. 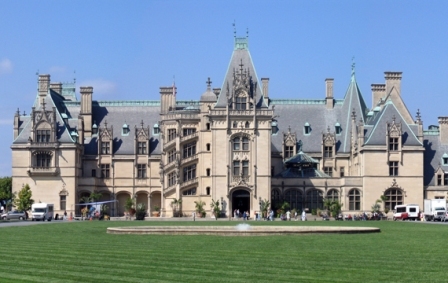 The Biltmore Estate in Asheville is the largest private residence in the United States. Constructed by George Vanderbilt II in the late 19th century, the house and extensive grounds are now open to the public and are popular destinations for visitors on almost every major holiday. Easter weekend is particularly popular as the magnificent gardens are in full bloom by then. Of course, there is also the massive egg hunt, one of the largest in the United States, as well as other Easter Sunday activities. The Biltmore Estate is located in the eastern foothills of the Great Smokey Mountains, approximately two miles south of downtown Asheville. 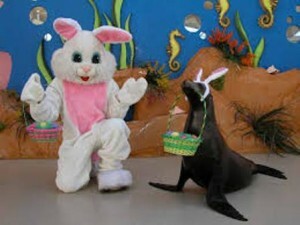 There are traditionally multiple egg hunts throughout the day, as well as magic shows, music and stories. 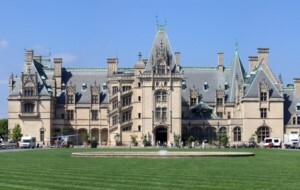 This year’s Biltmore Easter Egg Hunt will be held on Sunday, April 5th. 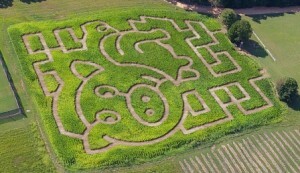 For a less formal egg hunt, one of the best in the south is held at Cedar Hill Farm in northwestern Mississippi. Cedar Hill Farm, a popular destination for agri-tourism, has been welcoming visitors to its petting zoo, hayrides, corn mazes, country restaurant and holiday events since 1995. One of the biggest annual events is the massive, multi-day egg hunt which runs throughout Easter week. Since the retirement of the world-record setting Garrison egg hunt in Homer, Georgia in 2009, Cedar Farm’s egg hunt has become the preeminent such event in the South. It is located just off I-55 on the south side of Hernando, approximately thirty miles south of downtown Memphis in Tennessee. Egg hunts this year run every day from Saturday, March 28th through Saturday, April 4th. The Miami Seaquarium is the oldest aquatic zoo in the United States. A groundbreaking attraction at the time of its opening in 1955, the Seaquarium broke away from the old civic aquarium concept and set the stage for a whole new type of theme park that would later be imitated by Sea World. It is one of the most popular family attractions in Miami. The Miami Seaquarium hosts special events during many holidays, including “Bunny Palooza”, the park’s self-proclaimed ultimate Easter Egg Hunt Celebration. It is located on Virginia Key, which is connected to downtown Miami as well as Key Biscayne by the Rickenbacker Causeway. Bunny Palooza takes place this year from Friday, April 3rd through Sunday, April 5th. The second largest Easter Parade in the South, and probably the best one that doesn’t involve a Mardi Gras-like atmosphere, is the one hosted by the city of Richmond. Reestablished in the early 1970s, the current parade is actually the oldest in the south. During the last few years it has taken place along Monument Avenue in downtown Richmond between Davis Avenue and Allen Avenue. The Richmond Easter Parade has grown in popularity since its inception, and now tens of thousands of people attend annually, to don their Easter finery and strut their stuff. But what really sets this event apart are the bonnet showcases, which are probably the best in the country. Hat enthusiasts descend on the place wearing everything from the traditional and elegant to the outrageous. 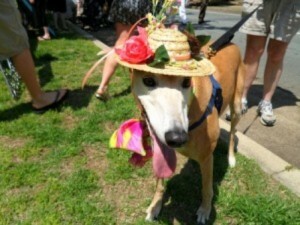 And for adorable animal enthusiasts, there is also a bonnet competition for pets. The Richmond Easter Parade takes place on April 5th.